The central part of Stockholm is based on 14 islands- so it truly is a watery city. Why not take advantage of this and see it by kayak or small boat? You can make your way through the central waterways, hopping in and out for a meal, coffee or spot of shopping, and continue on your way- working off the excesses by paddling. 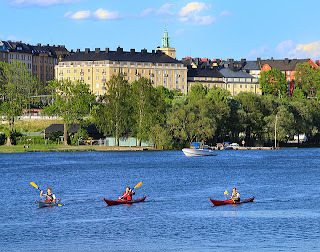 Kayak rental is usually priced at around 100 SEK an hour, although this varies, and there are multiple places to rent kayaks in the city- one is Kafe Kajak in Ralambshovs Park, a cafe and kayak rental place in the beautiful old building of the Stockholm Kayak Club. From there you can paddle the Lake Malaren side of the city. Over on the Baltic sea side, try Djurgardens Sjocafe- just make sure to avoid the shipping lanes! For the more adventurous, or those who are looking for some wide open spaces after campervan living, you can take kayak tours into the outer Stockholm Archipelago. These are more challenging, but Stockholm Adventures insists that "anyone can do it!"